"The Greatest Show on Turf" was a nickname for the record-breaking offense of the St. Louis Rams during the 1999, 2000, and 2001 National Football League seasons. The offense was designed by attack oriented offensive coordinator Mike Martz, who advocated mixing both an aerial attack and a run offense in the form of the Air Coryell style offense. The Rams' offense during these three seasons produced a largess of scoring, accrued yardage, three NFL MVP honors, and two Super Bowl appearances for the 1999 and 2001 seasons, of which they won the former. The offense was attuned to getting all five receivers out into patterns that stretched the field, setting up defensive backs with route technique, and the quarterback delivering to a spot on time where the receiver could make the catch and turn upfield. Frequent pre-snap motion and shifting were staples of the system, often including shifts to or from empty backfield formations or bunch formations. Pass protection was critical to its success. At least two of the five receivers would run a deep in, skinny post, comeback, speed out, or shallow cross pattern, and running backs would often run quick rail routes out of the backfield. Screens, draws, and play action passes were often used to slow the opponent's pass rush. Mike Martz credits the offensive system as being originally catalyzed by Sid Gillman and then refined at San Diego State by Don Coryell, who later transmitted his system to the NFL. Martz learned the Coryell 3-digit system from offensive coordinator Ernie Zampese when both coached for the Rams under Chuck Knox from 1994-96. Using this offense, the Rams set a new NFL record for total offensive yards in 2000, with an astonishing 7,335 yards (since broken by the New Orleans Saints in 2011 with 7,474). Of those, 5,492 were passing yards, also a new NFL team record. The term "Greatest Show on Turf" was not used to describe the Rams offense until several weeks into the 2000 season; initially the nickname for the Rams offense had been "The Warner Brothers", a play on the movie studio and a reference to new quarterback Kurt Warner, who'd assumed leadership from center after slated starter Trent Green was injured against San Diego in the preseason, and his receivers. The first appearance of the term came when ESPN's Chris Berman, preparing to cover highlights of a 57-31 win over the San Diego Chargers that year, said to television audiences, "Forget Ringling Brothers; the Rams are the Greatest Show on Earth." Over the following weeks, "Earth" was replaced with "Turf" to signify the artificial playing surface of the Trans World Dome and how it magnified and enhanced the Rams' already speedy offense. The term was retroactively applied to the 1999 team, as the offensive philosophy and key players were the same. Along with coining the name, Berman and his highlight show NFL Primetime consistently made references to the circus when covering the Rams in 2000. For the Chargers-Rams highlights that introduced the term "The Greatest Show on Turf," the William Tell Overture was played over the highlights rather than a standard NFL Primetime theme. The music was then muted when the Chargers were shown scoring a touchdown on the highlights package, and muted again when a flashback to Trent Green's injury was shown (Because the Rams were leading by so much in this game, Green came into the game in the second half making this his first regular season game since the injury, hence the flashback. The music resumed with Green leading the Rams to yet another touchdown). When the Rams finally lost in Week 8 to the Chiefs, a special introductory screen for the Rams as "The Greatest Show on Turf" was shown as a parody of "The Greatest Show on Earth" logo before the highlights of the upset were shown. Near the end of the 2000 Week 15 episode of NFL Primetime, Berman was briefly revealing the last two games that would be shown before cutting to a commercial break, as was standard for the show. The last game shown that week was the Vikings-Rams matchup. Since the Vikings also had a high-flying offensive attack (and, like the Rams, a poor defense), Berman announced, "The Greatest Show on Turf meet the Ringling Brothers and Barnum & Bailey!" Unlike his prior nickname for the Rams, the name for the Vikings didn't stick. 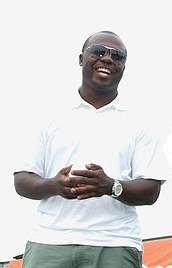 The Greatest Show on Turf was anchored by running back Marshall Faulk, NFL Offensive Player of the Year for three consecutive years from 1999 through 2001, quarterback Kurt Warner, 2-time NFL MVP, the receiving duo of Isaac Bruce and Torry Holt, as well as Az-Zahir Hakim and veteran Ricky Proehl. Together they formed the nucleus of the first team in NFL history to score 500+ points in 3 consecutive seasons (the 2010-2012 New England Patriots would become the second team to do so). Quarterback Kurt Warner and running back Marshall Faulk finished first and second in MVP voting each of the three years, also an achievement unmatched by any offense in NFL history. The Rams went 13-3, 10-6, and 14-2 in those three seasons, respectively, and reached the playoffs every year. In 1999, the team reached Super Bowl XXXIV and defeated the Tennessee Titans to claim the first franchise championship in almost half a century. The Rams lost in the first round of the 2000 playoffs to the New Orleans Saints, but returned the next year to reach Super Bowl XXXVI, where they ultimately fell to the New England Patriots. Though much less heralded, the St. Louis defense during those years modeled a praiseworthy unit and often outperformed opposing offenses that was essential to overall team performance. In 2000, when the Rams barely managed to reach the playoffs, the defense was ranked among the NFL's worst, giving up a league-worst 471 points that year. In 1999 and 2001, when the Rams reached the Super Bowl, their defense statistically ranked among the NFL's best – and fittingly, it was a last-second defensive stop known as "The Tackle" by Rams linebacker Mike Jones that sealed the Rams' memorable championship in Super Bowl XXXIV. The St. Louis Rams scored 526 points in the 1999 season, a team record which was broken in 2000 when they accumulated 540 points. For their last consecutive 500+ season, the Rams scored 503 points in 2001. These three seasons of 1,569 points were the most points scored by any team over any three-year stretch. 1999: The Rams were first in the league in passing (4,580 yards), yards per pass attempt (8.64), passing touchdowns (41) and total offensive yards (6,639). 2000: The Rams were first in the league in total offense (7,335 yards), completions (380), passing yards (5,492), yards per pass attempt (9.36), passing touchdowns (37) and rushing touchdowns (26). Their 63 offensive touchdowns was 5 more than the 1998 Vikings, and only 4 less than the 2007 Patriots. Quarterback Kurt Warner was cut in training camp by the Green Bay Packers in 1994, then three seasons later had a workout with the Chicago Bears fall through due to a scorpion sting he got on his honeymoon. After being cut by the Packers, Warner stocked shelves at a Hy-Vee supermarket in Cedar Rapids, Iowa. He was a starter with the Iowa Barnstormers of the Arena Football League and then continued to the Amsterdam Admirals of NFL Europe before ultimately signing with the Rams as a backup to Tony Banks. The Rams finished 13–3, a franchise best record for the 16 game schedule, which the 2001 Rams would break when they finished 14–2). Offensive coordinator Mike Martz's innovative variation on the Coryell offensive system suited Warner well; he threw only 13 interceptions during the regular season. For his innovation, Martz would be regarded as one of the most ingenious coordinators of his time. The Rams first demolished the Minnesota Vikings in the divisional round in a shoot-out, where Warner burned the Minnesota secondary for 391 yards and five touchdowns en route to victory. In the NFC Championship, the Rams faced the Tampa Bay Buccaneers, coached by Tony Dungy. Facing one of the league’s best defenses, Warner had one of the worst postseason performances of his career, throwing three interceptions to the heavily loaded Buccaneers secondary which featured John Lynch, Donnie Abraham, and Ronde Barber. However, the Rams proved they were more than just a good offensive team, as they prevented Tampa Bay from scoring any touchdowns, allowed only two field goals, and intercepted Shaun King twice. Trailing 6–5 late in the 4th quarter, Warner engineered the game-winning drive culminating in the go-ahead touchdown pass to Ricky Proehl to send the Rams to the Super Bowl with an 11–6 victory. Warner went on to throw for a Super Bowl record 414 yards, with two touchdown passes, including a dramatic 73-yard game winner to Isaac Bruce, against the Tennessee Titans in Super Bowl XXXIV, winning Super Bowl MVP honors. He continued to play for the Rams through 2003. After leaving the Rams, Warner played for the New York Giants in 2004 before signing with the Arizona Cardinals in 2005, playing with them until his retirement after the 2009 season. While with Arizona, he led the team to their first ever Super Bowl berth in Super Bowl XLIII, losing 27–23 in the final seconds to the Pittsburgh Steelers. Warner was elected to the Pro Football Hall of Fame as part of the class of 2017. Faulk was traded from the Indianapolis Colts to St. Louis in 1999, he was the second overall pick in the 1994 draft. Faulk had been an elite player in Indianapolis, but in St. Louis he put up some of the best all-purpose numbers in the history of the NFL. Indianapolis finished 13–3 but were knocked off in the first round, while the Rams eventually went on to win Super Bowl XXXIV. It was a storybook season. Faulk’s patience and diligence in learning the Rams offense paid off when he totaled 2,429 yards from scrimmage, eclipsing Barry Sanders’ 2,358 yards set in 1997. With 1,381 yards rushing (a superb 5.5 yards-per-carry average) and 1,048 receiving yards, Faulk joined Roger Craig as the only men to total 1,000+ yards in each category in a season. For all this effort and success, he was named Offensive Player of the Year and starter for the NFC squad in the 2000 Pro Bowl. Faulk was the MVP in 2000, and again the Offensive Player of the Year. He had 1,359 yards rushing in 14 games and set a new NFL record with 26 total TDs, a record that would soon be broken by Priest Holmes, then by Shaun Alexander, and later LaDainian Tomlinson in 2006 (Faulk missed 2 games in 2000). Faulk had 18 scores on the ground, setting a new franchise record, and 8 through the air. He also averaged 5+ yards per carry again, this time with 5.4. From 1999 to 2001 Marshall Faulk had what may have been the best consecutive seasons in league history. In that span, he scored 59 total TD's, rang up 6,765 total yards of offense (4,122 rushing and 2,643 receiving) and won the Most Valuable Player award and three Offensive Player of the Year awards. He was also named All-NFC, ALL-NFL, and selected for the Pro Bowl in each of those years. In 2011, Faulk was inducted to the Pro Football Hall of Fame in his first year of eligibility. Bruce was selected in the 2nd round (33rd overall pick) of the NFL Draft in 1994, by the Los Angeles Rams. 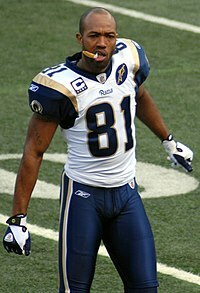 One of the Rams most enduring players, Isaac Bruce was originally drafted as a Los Angeles Ram and played with the franchise from their years of futility in the middle 1990s through the years of the “Greatest Show on Turf”. Over his career, he had 15,208 yards receiving, 1,024 receptions, 8 1,000+ Seasons, 40 100+ yardage games and 84 receiving touchdowns, all of which remain team records. He is arguably one of the best pure route runners to play wide receiver in the NFL. Bruce’s most notable catch came in Super Bowl XXXIV. With under 2:00 minutes left in the game, he caught a 73-yard pass from QB Kurt Warner, which ultimately would clinch the Rams' only Super Bowl win. In 1995, he had 1,781 receiving yards, second only to Jerry Rice (1,848) and was 5th ever for receptions (119). During the 1996 season, he led the league in yards (1,338). In 1999, Bruce totaled 1,165 yards receiving on only 77 receptions (15.2 yards per reception) and led the Rams with 12 touchdowns. A rookie during the Rams' 1999 Super Bowl championship season, Torry Holt became one of the premier wide receivers in the league. In 9 years, he had 7 Pro Bowl invitations. Holt also averaged the most receiving yards per season, and he had two 1,600 yard seasons, giving him a feat matched only by Calvin Johnson and Marvin Harrison. He reached 10,000 (116 games) and 11,000 (130 games) career receiving yards faster than any other player in NFL history and holds the record for most receptions in a single decade (868, 2000–2009) and also most receiving yards in a single decade (12,594, 2000–2009) and thus making the NFL 2000s All-Decade Team. Holt led the league in receptions in 2003 and yards in 2000 and 2003, that year the Rams went 12–4 (missing out on homefield advantage due to an upset loss to the Detroit Lions), and lost in double overtime against the eventual NFC Champion Carolina Panthers. Hakim was another player instrumental to the success of “The Greatest Show on Turf”. He was with the Rams for four seasons (1998 to 2001) before being signed as a free agent to the Detroit Lions. During the 1999 season, he caught 36 passes for 677 yards, which would bring in 8 touchdowns for the Rams. For his four-season run with the Rams, he accumulated a total of 2,032 yards with 16 touchdown receptions. Additionally, Hakim served as the team’s punt returner and was among the league leaders in 1999 and 2000. Proehl (WR) played in the NFL for 17 seasons and spent five of these with the St. Louis Rams between 1998 and 2002. During this period he was able to accumulate a total of 207 receptions and 2,590 receiving yards. At the 2000 NFC Championship, he caught the winning touchdown that allowed the Rams to beat Tampa Bay 11—6. Again, he caught a touchdown pass late in the game during Super Bowl XXXVI which at the time tied the game at 17–17, but the Patriots kicked a last-second field goal to win 20—17. He would go on to be a valuable cog in the Carolina Panthers’ offense during their Super Bowl year, and he also had a stint with the Colts. Pace was selected by the Rams with the number one overall draft selection in the 1997 NFL Draft after the Rams traded their number six overall pick, as well as third, fourth, and seventh round selections to the New York Jets. As a star at Ohio State University, a two-time Lombardi Award winner and an Outland Trophy winner, Pace was projected to be the top pick after Peyton Manning chose to defer the 1997 Draft. Pace became the first offensive lineman to be drafted first overall since 1968. In his NFL career, Pace became a seven-time Pro-Bowler and was the anchor of the offensive line for the Rams during this period of offensive dominance and is considered one of the best left tackles of the 21st century. Pace was elected to the Pro Football Hall of Fame as part of the Class of 2016. 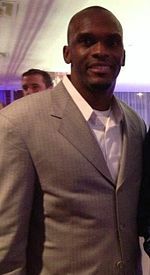 Drafted in the second round by the Rams in 1996, Conwell was the Rams’ starting tight end but did not play a huge role in their explosive offense. He was, however, seen as an effective blocker and locker room presence and could make the occasional third down catch. The 2002 NFL season is seen retrospectively by many Rams fans as the first season not being the "Greatest Show on Turf", though the team was frequently referred to as such for several seasons after 2001. The team had a record of 7-9 in 2002 and failed to make the playoffs for the first time in three seasons; many referred to this as a "Super Bowl Hangover" for the Rams because they lost a Super Bowl they were favored so heavily to win. Expectations were for the Rams to bounce back in 2003, so the name stuck even though the Rams were not the same team and did not enjoy the same level of success. They had another great season in 2004, but again, it did not have the same success as the previous years. 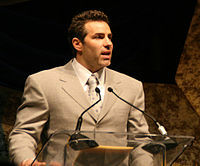 Kurt Warner struggled with the team after Super Bowl XXXVI, and with the emergence of Marc Bulger, was made expendable and released following the 2003 season; he would later return to form and lead the Arizona Cardinals to Super Bowl XLIII, where they lost to the Pittsburgh Steelers. Warner retired following the 2009 season. Bruce, the team's all-time leading receiver and the team's last remaining player that was with the team in Los Angeles, was released by the Rams following the 2007 season after 14 years with the team and spent the next 2 years with the archrival San Francisco 49ers before returning to retire as a Ram in 2010. Marshall Faulk retired in 2007 after missing the 2006 season due to injuries, while Ricky Proehl retired the same offseason after stints in Carolina and Indianapolis. Az-Zahir Hakim retired as a free agent. Torry Holt was released in 2009 and signed as a free agent with the Jacksonville Jaguars. Soon after he was released by the Jaguars. On April 20, 2010, he signed a one-year deal with the New England Patriots, but was placed on injured reserve in August and released shortly after that, and has retired. The last active player from the 1999 team, London Fletcher, retired after the 2013 season. ^ "Los Angeles Rams | History & Notable Players". Encyclopedia Britannica. Retrieved 2019-02-22. ^ "Saints top 'Greatest Show' Rams' yardage mark". ESPN.com. 2012-01-01. Retrieved 2019-02-22. ^ "Legends of the Dome reunites fans with 1999 championship Rams team". ^ "Los Angeles Rams Team History | Pro Football Hall of Fame Official Site". www.profootballhof.com. Retrieved 2019-02-22. ^ "Kurt Warner | Pro Football Hall of Fame Official Site". www.profootballhof.com. Retrieved 2019-02-22. ^ Podolski, Mark. "London Fletcher enjoys number retirement ceremony with former John Carroll teammates". The News-Herald. Retrieved 2019-02-22.